I’m going to build a new app. Actually I’m already working on it. I just thought why not document the process of its creation here on the blog. It turns out I have already started documenting the process. My previous post was about incorporating ads into an app. Guess what. That post came as a result of me working on my new app. 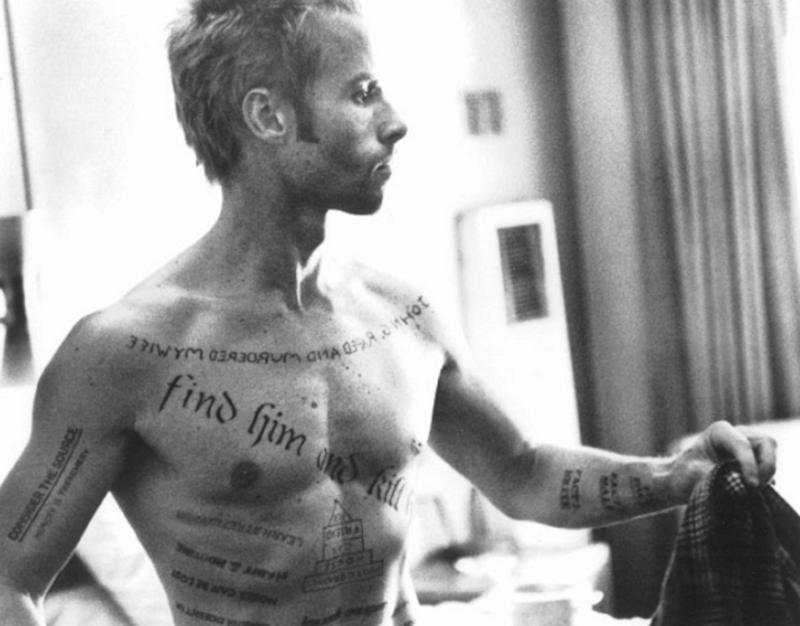 Have you seen Memento movie? It’s about a man who can’t form new memories as a result of past trauma. He is searching for people who attacked him and killed his wife. But he keeps forgetting everything he learns during his investigation. So he has to use a system of Polaroid photos, notes, and tattoos to track information he can’t remember. When I was watching this movie I kept thinking to myself that the movie wasn’t just portraying some curious condition of a traumatised mind. It also kept reminding me of the fact that we (by we I mean all humans) have a universal tendency to forget things. There were moments in this movie which reminded my of some moments in my own life. Like when the main character found out that the girl who he thought was helping him, was actually using him, taking advantage of his condition (she told him about it herself laughing at his face, knowing that in a couple of minutes he will forget about it). And the guy was frantically looking for his notes to write down this new information. There were moments in my life when I knew if I didn’t write down that genius idea at the very moment I had it, I would forget about it forever. Sometimes I would get out of bed in the middle of the night just to write something down. This is Casey Neistat. 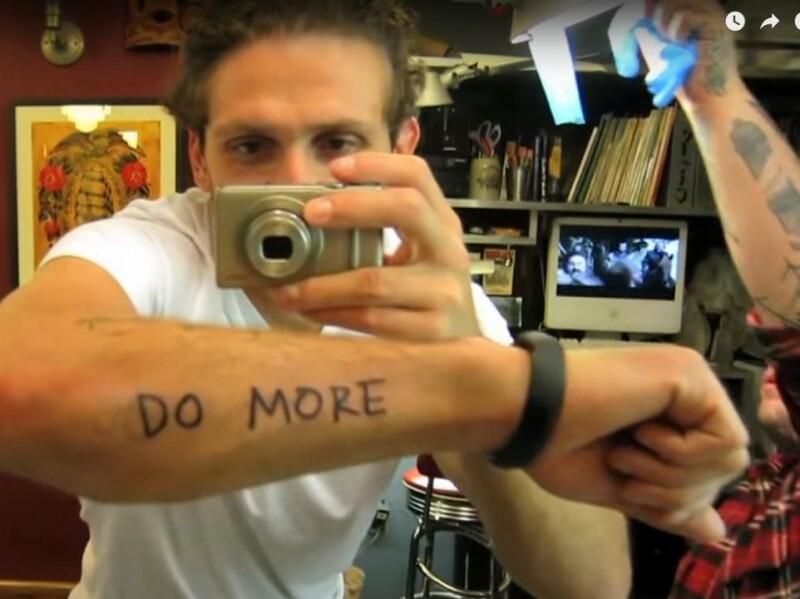 He has a tattoo saying “Do more” to remind himself to do more, obviously. When I saw this tattoo I thought that it was actually a good idea to use tattoos to remind yourself of something important. Also it reminded me of Memento movie. And that’s how the idea for my new app was born. Me, personally, I have a bunch of things I want to be reminded of every day. Only I don’t want to have tattoos. So I thought to myself, can an app substitute a tattoo? By now you have figured out the idea of my new app: it’s going to be an app that you use instead of a tattoo to remind yourself of important things (thoughts, ideas, quotes) every day. I couldn’t think of a good name for it, so I decided to call it ImpApp. Imp – means important, because the app is all about remembering the important things. Basically it will look like a list. But it’s not enough to just write things down. You actually need to read them every day. That’s the main problem with most productivity apps, like diaries and journals: you don’t read your own notes very often. So, my app will remind you to open it every day via local notifications. You might be wondering how this app is going to be different from Apple’s Reminders. Actually it won’t be very different. In fact when I first had the idea for this app many months ago, I created a list in Reminders called “Always remember” and set an alarm for 9:03 PM every day named “Read Always remember”. Here is what this list looks like. And I’ve already been using this list for months. So, if you want to benefit from this idea you don’t actually need to wait for me to release my app. Just use Reminders and set an alarm. But there is (or will be) one downside to using Reminders instead of my future app. 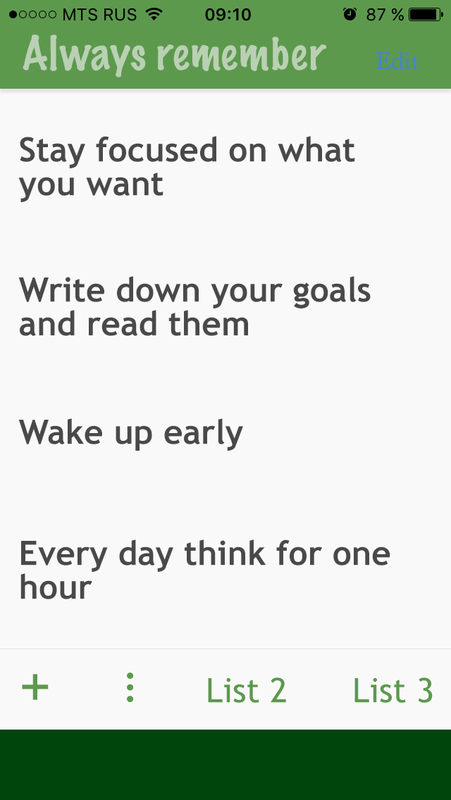 With time your list grows. And although all the things in the list are important to you they are not all equally important. 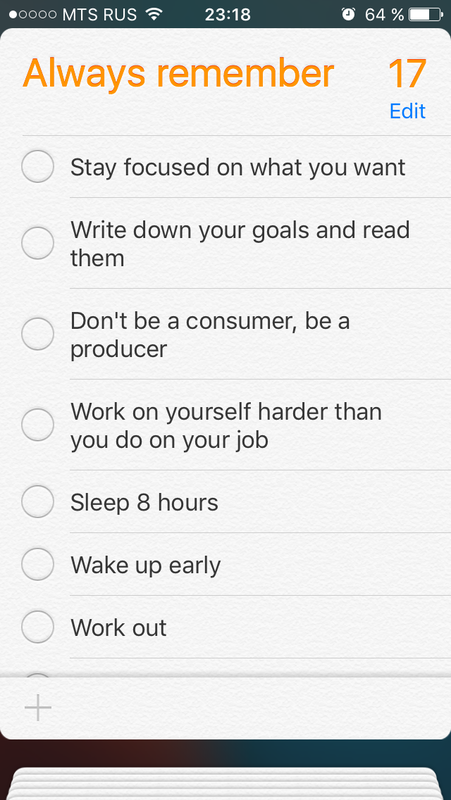 Basically your list gets cluttered with less important stuff, making it hard to pay attention to the more important stuff. So I thought it would be nice to have let’s say three lists. In the first one you can store up to 5 items. In the second one you store 20 items. And the third list is limitless. This arrangement will force you to sort your items according to their importance to you. Theoretically you could still do this in Reminders using multiple lists, only it is a little complicated. Here is what I came up with in terms of design. Mind you that it is not finished. I will work on the design some more. The dark green area at the bottom of the screen will be occupied by a banner ad. I think that if a person starts using this app he or she will continue to use it. And the reason is not the fact that I will use notifications to remind users to open the app (many apps do the same thing). The real reason is that the notification will remind users to read the list of things that they believe are important. They won’t mind the notification. They won’t be annoyed by it. So, I predict high retention rate for this app. People will be using it every day (hopefully). An that means that it makes sense to monetise the app through ads. I will be using just a little banner at the bottom of the screen to avoid annoying people too much. I think it is not the kind of app where people will tolerate full screen ads. Also there will be an option to remove ads with one small payment. I think this is the kind of app where you should have such option. There are other apps where it is not as important. Like a cooking timer. When I use a cooking timer app I just set a couple of timers and then go on with my cooking. I don’t look at the screen. So I don’t care if the ads are showing. And I would never buy a paid version to remove the ads in this case. But when you read a list of very important things, and do it every day, you should have an option to remove the ads. It’s just humane to provide such an option. I already incorporated ads and figured out how to use local notifications. Right now I’m in the process of implementing in-app purchases. I guess I’ll finish them tomorrow. Then I will need one or two days to work some more on the design. After that I will start actually building the app. It shouldn’t take too long. 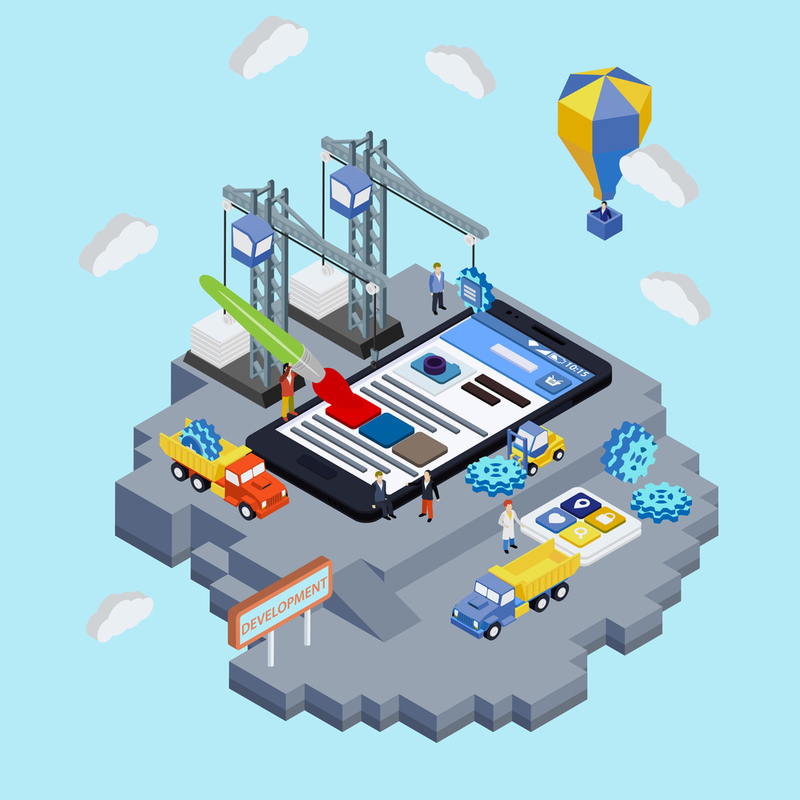 The app itself should be easy to build. Also a lot will depend on my day job. Recently I had to put a lot of extra hours into it. It definitely slows me down. I would say that the app will be ready in 2 weeks to 1 month. If you want to be notified when it is released write me an email. If you have a suggestion about my new app, leave a comment below.